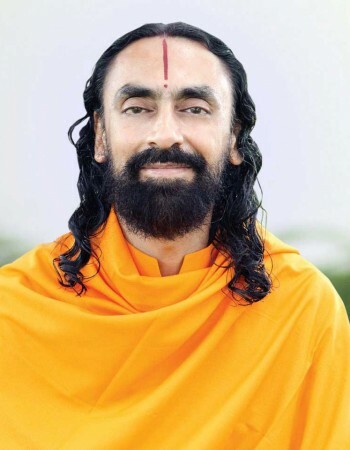 Swami Mukundananda is a renowned bhakti yog saint, yoga teacher, and a senior disciple of Jagadguru Shree Kripaluji Maharaj.He is the pioneer of the ground breaking Yogic system, “Jagadguru Kripaluji Yog”. 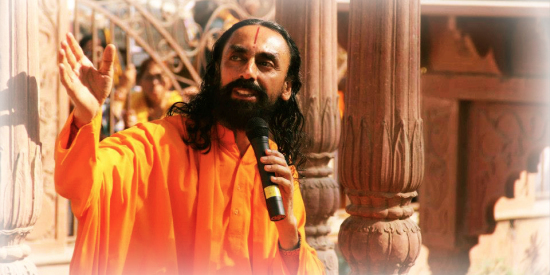 Swamiji was born on the 19th of December, 1960 and spent his early years in different parts of India with his parents. He completed his B.Tech at IIT, Delhi and subsequently his post-graduate management degree at IIM, Kolkata. Soon, he was walking the corridors of one of the biggest corporate houses in India and a flying career was set to take off. But Swamiji had other ideas. Slowly but steadily, his interest in the world of spirituality and search for a deeper meaning in life had grown from very early age. Swamiji recounts his experience as a youngster when he used to spend long hours in meditation and contemplation. His interest widened as he breezed past high school and college. He would pour into books of saints and scriptures to understand their teachings and increasing spend more time thinking about God than anything else. By the time he graduated, his hunger for spiritual awakening grew ever stronger and he started to follow the path of Shree Krishna Bhakti. Within a few months of his first job, he was already typing his resignation letter! Swamiji’s life took a turn for good with his renunciation of material progress and life. Taking up the order ofSanyas, he soon set out on a path of spiritual journey that took him to the holy land of Braj and many other places across India. His experiences with enlightened and scholarly saints only made his will stronger. His determination to find a true spiritual master was unflinching, and he continued his journey towards God for many years, learning from the holy saints he met with. During these travels, he closely associated with many elevated Saints of India, read the writings of the great Acharyas of the past and practiced intense devotion. 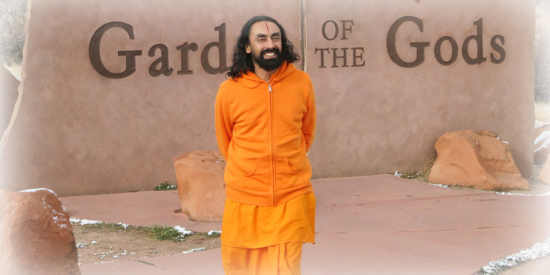 Over the last 25 years, Swamiji has inspired hundreds of thousands of seekers on the path of spirituality. His profound knowledge of many holy scriptures makes him a a highly sought after scholar. He reveals the ancient esoteric knowledge with rigorous scientific logic, in a modern context. Using perfect logic, and a scientific approach, Swamiji offers new ways of understanding and applying the knowledge of the scriptures in our daily lives. He dispels various myths and misnomers associated with many paths of God-realization, and his words penetrate even the toughest minds with his depth of understanding and scriptural veracity. Swamiji’s lectures cover the teachings of the Vedas, Upanishads, Shreemad Bhagavatam, Puranas, Bhagavad Gita, Ramayan, Eastern scriptures and Western philosophies. The ancient Hindu scriptures like the Vedas, Upanishads, Shreemad Bhagavatam, Bhagavad Gita, Ramayan, etc. are all treasure houses of Divine knowledge. They were either directly spoken by God in his various descensions on earth, or were inspired by him in the hearts of the Saints. But when these great scriptures are read individually, they appear to have many contradictions. This has led to much confusion in the minds of people. In his lectures, Swamiji answers such questions which have always puzzled people and shows the clear, simple truth. Contrary to the stereotype of a Swami created by the many generations, Swamiji is a very active, lively and extremely affable person. He starts his day well before dawn and works tirelessly well into the night. Most of his time is spent in serving people and helping them grow on the path of God-realization. In between his hectic schedule, he writes books, commentaries, answers tons of emails and letters. He lectures, teaches Yoga & Meditation almost every day of the year. His magnetic personality instantly attracts people from all walks of life towards his very cordial and loving nature. Swamiji’s training as an engineer and management graduate appeals very highly to the intelligentsia who like to learn spirituality with as scientific approach. His unique and highly methodical system of presenting the true philosophy about God is extremely rare to find in today’s world. Even the most erudite find answers to the toughest questions when explained with remarkable clarity of thought by Swamiji. His presence radiates love for the Divine and for all the souls who approach him for guidance. His ability to find time for almost every person who seeks his help is astonishing. He continues to be an inspiring beacon for many hundreds of thousands followers on the path towards God the world over.